Is Carrageenan Affecting Some People? Carrageenan is a common food additive that is extracted from a red seaweed, Chondrus crispus, which is popularly known as Irish moss. I am finding it is used in many of the boxed nut milks I use. In fact I am finding it can be quite difficult to find a box without this ingredient. Carrageenan, which has no nutritional value, has been used as a thickener and emulsifier to improve the texture of ice cream, yogurt, cottage cheese, soy milk, nut milks and MANY other processed foods. It is used in a wide variety of applications in the food industry as a thickening, gelling, stabilizing and suspending agent in water and milk systems. Finding a canned/moist pet food without carrageenan is not easy; far too many pet foods use this ingredient as a thickener in moist pet foods. Sourced from seaweed, it continues to claim it is safe – but science is proving the opposite. I suggest we all do our own research and see if this can affecting someone in our home, friends or even our pets. Don’t forget, making your own homemade nut milks is quite easy too and has zero caregeenan added. Use my favorite nut milk bag to use for delicious homemade nut milk! 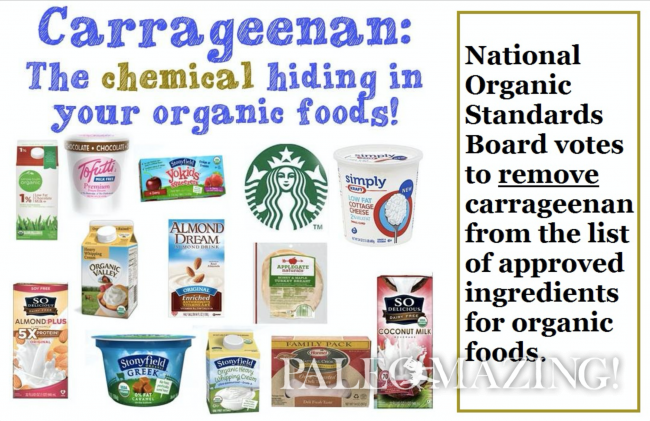 The NOSB voted to recommend carrageenan be removed from the organic allowed list not because they found it to be a health hazaard. The NOSB voted to recommend the FDA remove carrageenan from the organic allowed list for the reason “Not essential”. There is some debate on wether this truly the case or not. The FDA will make the final ruling on carrageenan’s status as na organic allowed ingredient. Thanks for the information Debbie. I guess we will see what they’d decide to do in the end then. I know many people who do terrible with carrageenan and have felt a major difference since removing it from their diet.